The 3203 model is a non-blocking Full Fan-Out (any input connected to any output simultaneously) solid state switching system which operates in VHF-band: from 20 MHz to 1100 MHz. The system can be configured either with (8) SMA type inputs and (16) SMA type outputs; with a starting configurations of 8 inputs and 8 outputs. The 3203-series is equipped with Windows XP operating system (CPU), LCD touch screen display for local control and redundant power supplies with LED monitoring on the front panel. 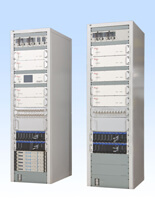 Remotely, it isÿoffered with Ethernet adn RS-232 interfaces.